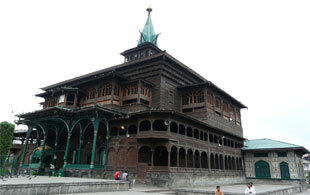 Kashmir Pilgrimage Tours offers a different interpretation of discovering this prominent tourist site. This journey reveals the spiritual aspect of Kashmir that is surrendered towards the almighty. There are mosques and tombs in the region that are undoubtedly its best-kept heritage besides its natural wonders. Besides visiting the Islamic shrines, the journey also includes a visit to the tourist attractions like Gulmarg and Pahalgam, making it a soulful sojourn. After early breakfast, check out Delhi and transfer to airport to board a flight for Srinagar, the center for Kashmir Pilgrimage Tour. Upon arrival here, check in the Hotel/ Houseboat. Day at leisure and overnight stay in Srinagar. After breakfast, begin the Kashmir Pilgrimage tour with a visit to famous mosques and shrines in the summer capital of Jammu and Kashmir. These shrines, typically built in wood present the city’s most attractive features. First visit the Mosque of Shah Hamadan in the old city and the Shah Makhdum Sahib Shrine dedicated to a Sufi saint who helped the spread of Islam in Kashmir. The ruined stone mosque of Akhund Mulla Shah was built by Dara Shikoh in the 17th century. The nest is the most important Islamic shrine in the city. This is the Hazratbal Mosque which enshrines the city’s most revered relic, a hair from the beard of Prophet Muhammad. Next in the series is a visit to Charar-e-Shareif. This is a tomb or Dargah dedicated to Sheikh Noor-u-din Noorani, a poet who preached Islam through his poetry. Return to the hotel for overnight stay. After breakfast, begin exploring Srinagar surreal attractions with a visit to its Mughal gardens. First visit the Nishat Garden known as 'garden of pleasure' built in 16th century (1633) by Empress Nur Jahan’s brother Asif Khan. Next visit Shalimar Bagh, the largest of the Mughal gardens was built by Mughal Emperor Jahangir for his wife, Noor Jehan in 1619. This garden represents the zenith of Mughal horticulture. Also visit Chashme Shahi, the royal Mughal garden built around a spring by Ali Mardan, a governor of Mughal Emperor Shah Jahan. Later you can visit the world famous Tulip gardens in Srinagar. Evening is free for shopping. Dinner & overnight stay. 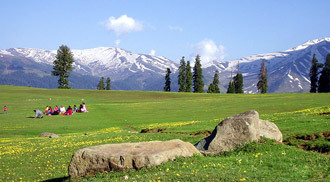 In the morning, transfer to Gulmarg, the enchanting meadow of flowers. Located at an altitude of 2730 meters, this is also dedicated to the country’s highest golf course and also one of the few skiing grounds. Amidst the backdrop of the snowy mountains, enjoy a walk through the scenic meadows of flowers. One can even avail pony ride or Gondola ride (rope way) to Khillanmarg. Dinner & overnight in Gulmarg. Check out Gulmarg for Pahalgam. Enroute visit Pampore, famous for its saffron cultivated fields. Reach Pahalgam, dotted with mustard fields is a natural paradise known for its curative Sulphur springs. Check in the hotel for dinner and overnight stay in Pahalgam. After breakfast, free time till departure. Check out from the hotel and transfer to Srinagar airport to connect the flight for Delhi. Upon arrival, check in the hotel for overnight in Delhi. Check out Delhi and in time transfer to airport to board the flight for onward destination.